Rob Kaufman tells us how his novel came about! Interesting to say the least-Read on! For my take on this psychological thriller--come back on 9/28. There will be a give away for a $100 Amazon GC at that time. On the positive side, the experience was the start of my best book so far – One Last Lie – a novel that has made people mad, sad, happy and most importantly, it has made them think." Philip and Jonathan have had the perfect life together for ten years - fulfilling every dream except that of having a child. Along comes Angela, Philip's college friend who apparently conquered her old demons of obesity and manic-depression. After reacquainting and becoming good friends, the three decide to have a child together through artificial insemination of Jonathan's sperm. From that point, Philip and Jonathan's idyllic life begins to unravel. Angela's mask of deceit gradually slips as her pregnancy awakens psychological and physical problems, leaving Philip and Jonathan regretting ever allowing her into their lives. Told from an elderly Jonathan's hospital bed, Angela's tangled web unwinds into heartbreak, deception, legal battles, and finally murder - with a surprise ending no one could have ever imagined. This book can be purchased at Amazon, Barnes & Noble and other fine bookstores. This is Rob... 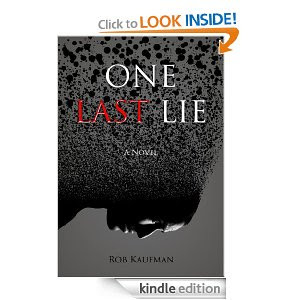 I just wanted to thank you for talking about "One Last Lie" on your blog AND for taking the time to read and review it. This has been my first time visiting your site and it will absolutely NOT be my last. There's so much on here to enjoy, it's hard to know where to start... but I did... and think it's great!